Mass Nutrition is one of Australia’s largest suppliers of sports nutrition and supplements via both online and instore shopfronts. 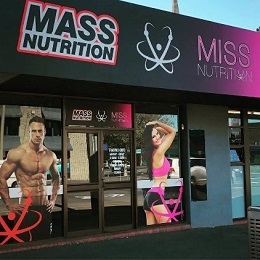 With more than 25 retail shopfronts in Australia and continuously growing, Mass Nutrition leads the industry with up-to-date knowledge on nutrition and supplementation whilst providing competitively-priced sports supplements and nutritional products from around the world. Stemming from a love of training, owner and founder of Mass Nutrition, Kurt Henry, first started the business as an online store in 2006. After online success in this area, Kurt decided to branch out in 2007 and took on a retail shop front in Tweed Heads, QLD to create and grow a retail presence to give customers a more personal shopping experience. Today, the Mass Nutrition brand has grown considerably and is known Australia-wide not only within the fitness industry, but the general public, who have an interest in supplementation for general health and assistance with training. The Mass Nutrition family prides itself on supplying quality products, great customer service, offering complimentary training and nutritional advice, supplementation strategies and, in turn, assisting customers to reach their overall health, fitness and life goals. Being a Franchisee of Mass Nutrition Australia allows you to become your own boss in an industry that you are passionate about. We are one of the largest retailers of supplements and sports nutrition products in Australia and growing. We sell quality, profitable products backed up with industry knowledge and support. The entry and set-up costs of a Mass Nutrition are relatively low in comparison to other businesses and you are given the freedom to operate your business how you like. In 2017, a new structure commenced, taking on further investors and directors allowing the company to expand, and now a forecast of 50 stores will be open by the end of 2018. Full support of the Mass Nutrition network and Head Office team from the very start. What are the estimated establishment costs? The cost can vary depending on the availability and size of the selected premises needed to service the market area in which you are going to operate. The prospective owner should have sufficient financial resources to sustain the operation in the initial set up stages estimated at the total cost between $97,000 and $172,000. Once a shopfront has been selected, the fit-out team will be able to provide an accurate quote for the fit-out to occur based on Mass Nutrition design parameters. What are the ongoing fees and other related fees? To get started you will be required to pay your licence fee upfront and this will secure your store and help until you open. Once you open you are then required to pay the licensing fee monthly, which is $12,000 divided into 12 monthly payments. Where do we want to open & what territory do I obtain as part of the Licensing agreement? The Mass Nutrition family is continuing to grow with new shopfronts opening and opportunities arising daily. We have a goal to have more than 150 stores by the end of 2020, spanning from Nationwide, including Tasmania. This is your opportunity to be a part of the MASSive Family and become part of an organisation that is growing and delivering exceptional customer experiences daily. Your territory will be a specified radius from your shopfront location. Mass Nutrition is looking to work with dedicated individuals whom are passionate about the health and fitness industry and want to become their own boss. No qualifications or prior experience are required, however, aligned value and an interest in the fitness and sport supplement industry would be an advantage. You can complete a sports supplementation course at various training providers in Australia. What marketing support is provided? Marketing support is provided to stores with relation to national campaigns and promotions. You are responsible for local area marketing and advertising of your own territory. What assistance is provided with the store fitout? Once confirming a store location, you will be provided with Mass Nutrition’s official Fit Out and Design Manual, which will detail all scheme and building requirements. What is the ideal size of a Mass Nutrition store? Approximately 70-120sq.m, but this needs to be considered in relation to position and rent. Do I need to be actively involved in the operation of my store? We have found, from experience, that when a store owner is actively involved with their shop that the shop tends to perform better and in turn sees a greater reward. Are there opportunities for expansion? Opportunities for growth are outstanding, with most owners operating multiple stores.